Making sense of Netflix’s wildly careening Maniac is entirely up to you, but don’t worry, be happy that there’s something so adventurous to behold. Set in a near future, as is Hulu’s recently released The First, this is a high degree of difficulty drama that’s all over the place, but mostly in good ways. Stone and Hill respectively play lost souls Annie Landsberg and Owen Milgrim, whose senses of self worth are badly damaged. Annie is guilt-ridden about her sister, Ellie (Julia Garner), and estranged from her mostly unseen mother. Owen, part of a wealthy, amoral family, has been diagnosed as schizophrenic, but is he really? Whatever the case, he’s expected to lie for his brother, Jed (Billy Magnussen) -- who’s facing trial for sexual assault -- or be ex-communicated by his cutthroat father (Gabriel Byrne). It’s all based on a same-named Norwegian series and billed as a “dark comedy.” But the darks are darker than the lighter moments. And when Maniac wants to be gruesome, as in Episode 7, well, it certainly can be. All 10 episodes were made available for review, with the running times varying from roughly 30 to 40 minutes. By Episode 2, both Annie and Owen have been accepted into the Neberline Pharmaceutical and Biotech program for a three-pill experimental trial that purportedly will make them whole again. But first must come a series of mind trips that initially are under the supervision of doctors Muramoto (Rome Kanda) and Fujita (Sonoya Mizuno). This episode ends with a big jolt for viewers, if not particularly for Annie. Both of the main characters are transported to various disparate worlds. But Annie and Owen aren’t supposed to intertwine in them. And when they keep doing this, remedial steps must be taken. Saying a whole lot more -- not that it’s easy to do so -- would give away too much. But you’re in for a constantly zig-zagging experience complete with visual feasts and character shifts. As this show goes on, there also are some terrific supporting performances by Justin Theroux and Sally Field in the roles of Dr. James Mantleray and his mother, Dr. Greta Mantleray. Theroux is particularly superb in Episode 6 while Field comes to the fore in Episode 8 -- and then keeps on doing so. Look also for a grieving computer named “The GRTA” and also known as Gertie. 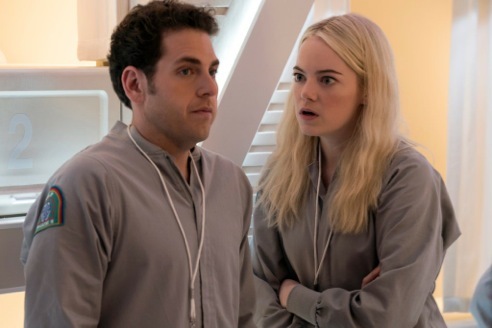 During the course of Maniac, perhaps you’ll be reminded of 2001: A Space Odyssey or Westworld or Game of Thrones or Goodfellas. It’s easy to let one’s imagination run buck naked. Stone’s Annie likewise is an open sore, suffering in an outwardly more cynical fashion but torn asunder nonetheless. All of this may sound too daunting and not worth the head-hurt. But Maniac pretty much sorts itself out in the end, with Episode 10 offering open-ended, but satisfying closure. As with Memento, though, it can be watched again and again in search of further understanding. In very recent years, young actresses at the top of their games have taken full plunges into small-screen series or limited series. Evan Rachel Wood in HBO’s Westworld. Amy Adams in HBO’s Sharp Objects. And now Emma Stone in Maniac. It’s a whole new world out there, almost to the point where feature films someday may be seen as a step down. Maniac, for its part, throws down a tale that swerves to the left and swerves to the right without ever losing velocity. But seeing is believing while not believing what you’re seeing is also part of the experience.